A fireplace can make a major statement in any room. It’s a natural focal point and a big guidepost to the overall style of a room. While I love the look of a natural stone or brick fireplace surround, I also know that not every color of brick and stone meshes with every homeowner’s personal home style. 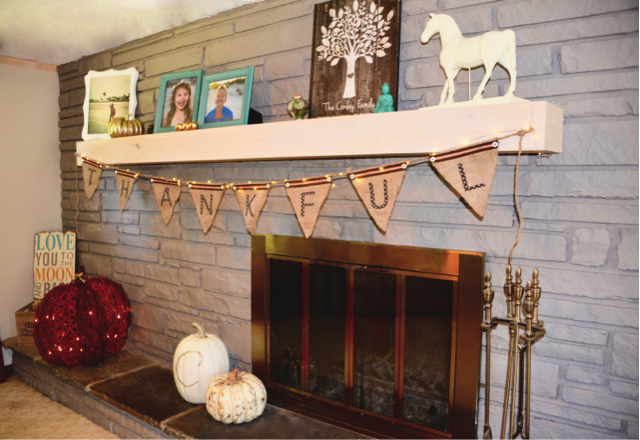 The easy solution to transform a ‘not-my-style fireplace’ into your style is painting the surround in a fresh new color. With the texture challenge of brick and stone, it can seem like a daunting and time-consuming task. It really isn’t. 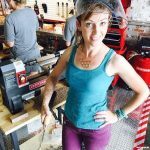 We just need a color that fits your vision, the right paint tools for this DIY job, and a day to complete the project. Selecting color can be fun, and it can become a little overwhelming. Even if you know you want to choose a simple color like gray or white, there are still so many varieties of colors you can choose in each color category. Making the final decision among five different grays or whites usually comes down to the other design elements in a space. The reason is that the kind of light, warm or cool, and the colors of walls and furnishings can affect the way a color looks. So, when you are looking through paint chips at the store, take advantage of the light viewer. Some paint stores, like Sherwin-Williams, have a light station to help show how a paint color looks in different light. Another way to make sure your color is a good pick for your home is to try a few sample paints to see how the colors look in the room. Look at the colors in morning, midday, and evening light, as the color may change dramatically depending on the light your room gets from the sun and from your interior lighting. If you aren’t excited about spending the extra money on sample paint, you can get an idea of the colors from putting the paint chips on the wall. And, keep in mind that leftover sample paints can be used in crafty projects or wall art for the room. Beyond color, there are several choices when it comes to buying paint. For painting brick or stone, I recommend choosing an exterior paint. If you think about where most brick and stone pop up around a home, it’s outside. Then there’s the decision about sheen, how shiny you want your finished fireplace. If you are going for a sleek, modern look, then try a gloss. If you are more into a more casual farmhouse style, then a sheen that’s less shiny like eggshell is best. Before applying paint to a textured surface, it’s important to brush out any dust from the crevices. 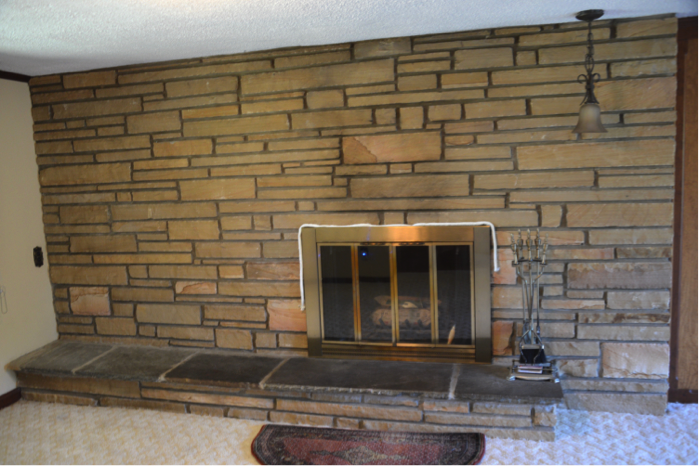 For a brick or stone fireplace, there are a lot of mortar joints that will need to be brushed out. I just use a paintbrush, and then wipe the entire surface clean with white rags. The cleaner the surface, the better paint will adhere. 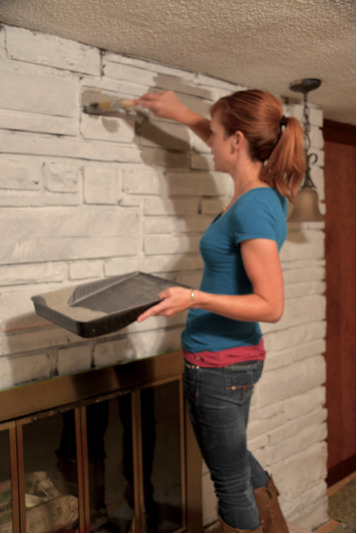 Choosing the right paintbrush or roller makes painting a stone or brick fireplace surround easier. I recommend choosing one labeled as exterior. They are usually thicker and designed for exterior grade paints. This will help reduce drips and save time by cutting the trips back to the paint can or tray. To get the paint into the mortar joints, I’ve discovered that a 1.5-inch angled brush really does a good job. Priming the surface really does help ensure even coverage and stronger adhesion for the finished paint color. Choose a primer that’s designed for porous surfaces, like brick and stone. Paint undergoes a chemical reaction with surfaces, so there’s a real difference in the type of paint or primer you choose and the results you’ll get. If you’ve chosen a dark color for the finished fireplace, then you can save time later by either having the primer tinted at the store, or by adding a few drops of your colored paint. This can help reduce the number of coats you’ll need to apply. Painting brick and stone takes a different approach than painting a flat surface. The texture and the mortar joints create tons of extra opportunities for paint to flow where you aren’t intending and to create little drips. The approach that works best for me is to start in the mortar joints, and then paint out from there onto the raised surfaces. Always brush back into the joints to follow the path, and make sure paint doesn’t pool in the joints. While it’s less graceful looking, I find it’s more effective to both push the brush into the texture and wipe the brush across the surface when trying to get paint to cover all of the texture. For textured surfaces, plan to apply at least two coats. Before putting everything away, carefully look at the surface from different angles, just to be sure everything is covered. With a fresh coat of paint, your fireplace will be ready to be a main style feature in your home.